According to the Facebook Help Center, you automatically follow people who you're friends with. You can also follow Pages (example: businesses, organizations, brands) and people who aren't your friend on Facebook but allow everybody to follow them. When you follow someone or a Page, you may see updates from that person or Page in your News Feed. If you like a Page, you'll automatically follow it. 4. Click Reconnect with people you unfollowed. 5. Select a person, Page or group. 1. Click Liked (on a Page) or Joined (in a group) near their cover photo. To follow a person directly, click Follow near their cover photo. 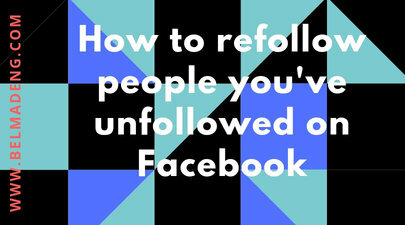 That is how to refollow people you've unfollowed on Facebook.